On a hot summer’s day, an exciting sound, filled a club in Hongdae, Seoul, reminiscent of a passionate and enthusiastic music festival. The club is CJ Azit Gwangheungchang. There, we could enjoy beforehand the splendid line-up of “2016 Jisan Valley Rock Music & Arts Festival,” now a month away. We will bring you an update on the Live Club Day of June held at CJ Azit Gwangheungchang. In particular, this performance was broadcast live on the Naver V App. If you want to experience the energetic Live Club Day of June, pay attention! CJ Azit Gwangheungchang Hinting at a Prelude to the Festival! "Live Club Day" is a boundless music festival held in Hongdae on the last Friday every month. This is when you can enjoy more than a dozen clubs for the price of one. For the Live Club Day of June, CJ Azit Gwangheungchang offered a chance to meet "Valley Rock Festival," the legend of a summer festival. With the Naver V App broadcasting the performance live, worldwide music fans were able to watch the scene together. The grand “Jisan Valley Rock Music & Arts Festival," marking its seventh incarnation this year, is just around the corner. Interesting events for celebrating it were followed by the eagerly anticipated artist performances. Beer, popcorn and fortune cookie were presented to those with "Live Club Day" bands on their wrists. Many enjoyed a cool beer before the performance. A special event was prepared at the lobby of the concert hall for a time together with musicians who would appear on stage. Fans were writing what they were curious about the musicians on Post-its with a mind to want to hear directly from the musicians on stage. Even before the performance started, interesting times unfolded as if it was in the middle of a music festival. Flash lighting and the exciting music of CJ Azit Gwangheungchang brought a festival mood to the audience from the beginning. A luminous stick given away to each one as they enter had "2016 Jisan Valley Rock Music & Arts Festival" inscribed on its surface. With a luminous glow filling the concert hall, the audience fully enjoyed the festival in the heart of downtown. First stage, the fresh four-member band "Reflex"
The first team came on the stage of CJ Azit Gwangheungchang for the Live Club Day of June. It was "Reflex", a four-member band consisting of Cho Gyu-hyeon on vocals and guitar, Hong Seok-won on guitar, Byeon Hyeong-woo on bass, and Shin Dong-yeon on drums. The band is distinguishing itself by working its way up through Superweek, the final round of the audition program from Mnet, "Super Star K7". The Valley Rock festival would be the second stage for the band. Cheer Reflex and its cool music. The vocalist said "the concert would be the best time to glimpse the future of Korean rock music." The hot passion of the rock festival was felt in his confident voice. He passionately sang "Getting Black," the title song from Reflex, greeting the explosive cheers of the audience with great music. "Boy" was deeply impressive with the guitar riff. It highlighted the dreamlike mood, making the charm of vocals better. "I hope you will listen to the fresh music performed in the clubs by all the different bands here," said Reflex on the stage of Live Club Day of June, adding that they were working hard for the Valley Rock Festival! Here’s to Reflex, who are busy preparing for their next concert. Would you like to quickly watch their great show at the Valley Rock Festival? Second stage, band "Bye Bye Badman," a leader of Blue Pop! The next team on the stage was "Bye Bye Badman," the fifth Tune Up of CJ Culture Foundation. 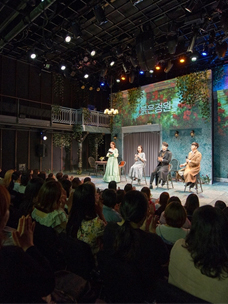 The band, consisting of Jeong Bong-gil on vocals, Go Hyeong-seok on keyboard, Lee Ru-ri on bass and Gwak Min-hyeok on guitar, displayed an attractive sound captivating the heart of the audience in CJ Azit Gwangheungchang. "Bye Bye Badman" introduced its new song "Genuine" was released on the day of the performance for the Live Club Day. The song, made together with producer Chris Coady last year, is marked by an appealing voice of the vocalist and a harmony between instruments. It is also expected to be produced as a music video, so please give them your support. They will show a nice performance at the 2016 Jisan Valley Rock Music & Arts Festival, which is now just one month away. We hope you enjoy the forthcoming concert of Bye Bye Badman. Hope you enjoy their performance at the exciting festival! Q. Could you give some introductory words to the audience attending Live Club Day of June? A. Hello, everyone! We are a music band named "Bye Bye Badman." Jisan Valley Rock Festival takes place this year as always. It’s a month away. Many people will join in and enjoy it. Ahead of the Valley Rock Festival, CJ Azit Gwangheungchang is holding the "Valley Rock Preview Night" today. We hope you will have a fun time together with us. Q. There are live performances on stages such as Live Club Day or festivals. What do you think is the charm of live performances? A. I love the audience connection you get at live performances. It gives such an energetic and passionate atmosphere. 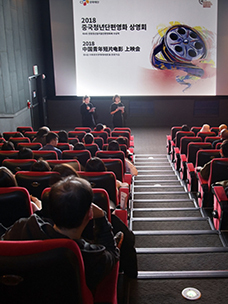 The audience can fully feel the atmosphere, while enjoying and playing together with each other. This is the charm of live performances. Q. If you are looking forward to the Jisan Valley Rock Festival, let us know. And please give support the Valley Rock Festival. A. We have amazing things to prepare for the Jisan Valley Rock Festival. It's a secret. Please come to see it. Bye Bye Badman will come on the main stage on Saturday July 23. Of course, the sun will be hot in the middle of summer, but we hope many people will come and enjoy together. Meet at the Velley Rock Festival. Third Stage, the band "Soran" enjoys a cheerful crowd sing-along! The performance was filled with heated enthusiasm and passion. The band adorning the third stage appeared with loud cheers from the audience. It was the much-loved band named "Soran" consisting of Lee Tae-wook for guitar, Go young-bae for vocal, Seo Myeon-ho for bass, and Pyeon Yu-il for drum. The number of Naver V App's viewers soared to almost 10,000 just with the appearance of "Soran". Their speech and interesting performance were well received by audience. They displayed a strong and solid sound for a short time. The crowd sang along with the band, making the atmosphere more exciting. In particular, "Don't Lose Weight," the fans’ favorite song of all, seemed to make all the female audience's hearts beat. The band gave the audience an unforgettable time to enjoy by singing along and shaking glow sticks. The "Soran" band said it's been a while since they performed at clubs. They passionately and excitingly put on the performance. It's a golden opportunity to meet a line-up of musicians of Valley Rock Festival in advance. They will soon meet their fans with their regular third album. The Valley Rock Festival is the first time for them to take the festival stage. The much-awaited sound of Soran can be enjoyed on the festival stage. With a determination to breathe fresh life into the music scene, they are preparing for the Valley Rock Festival. Please give the band much interest and enthusiasm thanks to their hot energy. Fourth Stage, "Pia," a legendary band marking its 15th anniversary! The band completed the grand finale of "Valley Rock Preview Night X CJ Culture Foundation." It is "Pia," a legendary band marking its 15th anniversary this year. Consisting of Ok Yo-han on vocals, Heolraeng on guitar, Gi-beom on bass, and Hae-seung on drums. Leaders of the new metal genre, the band has already created a huge fan base. The feeling of Pia on the stage was overwhelming. Pia has recorded the most appearances of the "Valley Rock Festival": the fifth one this year. Ahead of the festival stage, the band created a song based on a long relationship with Valley Rock. The song is expected to be released just before the festival. Don't you already have high expectations about their new song? 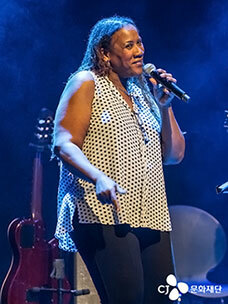 Pia marked its 15th anniversary this year, while releasing new songs in the interval. They also debuted a new song on the stage of Live Club Day in June. The song titled "Shine" elicited deep sympathy from the audience. They said they would continue to release a string of new songs this year. If you listen closely, you can almost hear the audience cheering for the new songs now. Preparation for their set list at the Valley Rock Festival is already well under way. As they have always shown, the band members said they focused on throwing the audience into a state of feverish enthusiasm. Their show on the stage of CJ Azit Gwangheungchang was as exciting as a festival stage. They displayed the best performance as if they thought they were on stage at the Jisan Valley Rock Festival. The feeling of perfect harmony with the crowd epitomized all the passion of the rock festival. The "Valley Rock Preview Night X CJ Culture Foundation" for the Live Club Day of June finished as a prelude to the "2016 Jisan Valley Rock Music & Arts Festival", which is now a month away. The four bands gave incredibly passionate performances. We expect to meet them again at the Valley Rock Festival. 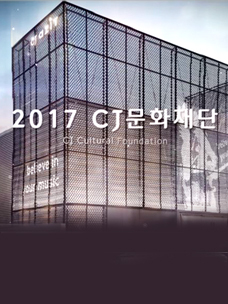 Cheer them together with the CJ Culture Foundation! Come join in with the "2016 Jisan Valley Rock Music & Arts Festival" from July 22 to 24.